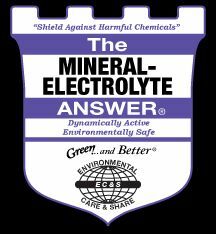 THE MINERAL–ELECTROLYTE ANSWER® helps regulate, restore and balance the ‘Electrical Life’ of each cell, as it acts as a conductor to provide the essential energy required to survive, thrive and function. It’s a liquid source of low-molecular-weight, bioactive electrolytes that are water-soluble and derived from all-natural fulvic acids that stimulate the plant’s metabolism, growth and development. THE MINERAL-ELECTROLYTE ANSWER®provides plants and microbial life with trace minerals and a natural magnetic charge (conductivity), affecting the health and growth of cell life by stimulating various physiological and biochemical processes related to cell metabolism.